If you’re looking for a new way to increase your audience and drive more engagement to your Facebook Page, Facebook ads are a great solution. But before you start spending advertising dollars, you should first define who your target audience is. The Internet is noisy, and Facebook — which just passed 1 billion members — is no exception. Everyone is competing for attention, which is why it’s necessary that your audience believes you’re talking specifically to them. It’s recommended that you create an outline of your ideal customer, including details like location, gender, interests, and so on. 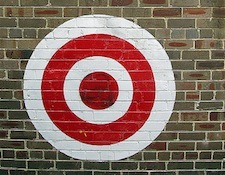 Once you know who you’re going to target, you can begin building a plan around how you will market to them. In this article, we’ll show you the most effective ways in which you can target your Facebook ads to reach your ideal audience. Creating a target audience can be challenging, which is why it’s best to start big and narrow it down from there. For example, first decide whether you’re marketing to a local, national, or international audience — by default your country is selected, but you can manually type in the names of others. You can also focus on one or more states or cities. If you choose cities, you’ll have the option to include additional cities within a specific perimeter — the least being 10 miles and most being 50. If you want to get even more specific you can target your audience by zip code. This is especially convenient for local businesses with a small number of physical locations. From here you can narrow down your audience even further by selecting an age range, which can be a loose guideline, or you can check the box requiring an exact match. You’ll also be able to target based on gender. Now it’s time to make your ad more relevant. Keeping in line with the broad-to-narrow approach, Facebook has provided several umbrella categories for you to choose from, including Activities, Interests, Family Status, Mobile Users, and more. These categories can be drilled down even further to fit your specific target. For example, selecting Family Status will let you target people who are away from their hometown, recently engaged/married, expecting a baby, and so on. Mobile Users (iOS) lets you target individuals based on which Apple devices they own, including the new iPhone 5. These are pretty big categories, even with all of the sub-channels. If you still want to get more targeted, you can add Precise Interests, which allow you to type in a target. For example, if you’ve selected Sports > Football (American) from the Broad categories, you can focus on a specific team by typing it into the Precise box. Facebook will also generate related Likes and interests for you to choose from. 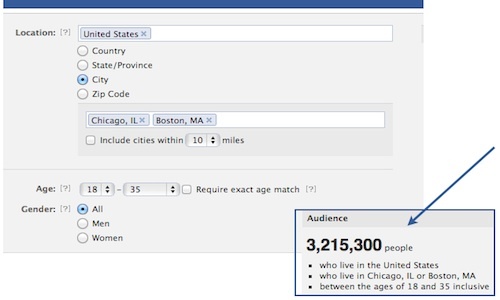 Although a small section, Connections will have a big impact on your Facebook ad’s reach. This is where you determine if you’ll be targeting existing fans or potential new ones. For example, if you’re promoting an Offer exclusively for new customers, you’ll likely target people who aren’t already connected to your brand on Facebook. 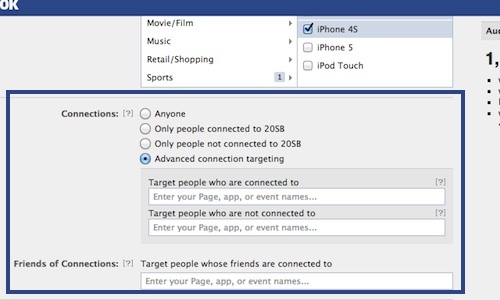 Facebook also gives you the option of targeting people who are connected not just to your Page, but your app and/or event as well. You can also choose to exclude people connected to these things. 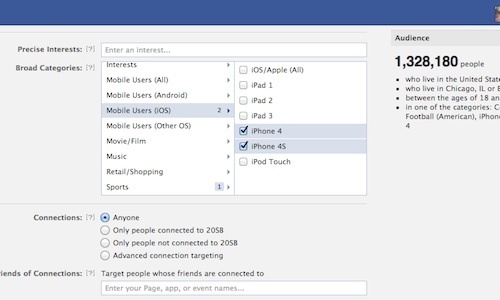 Additionally, you can choose to target people whose friends are connected to your Page, app, or event. 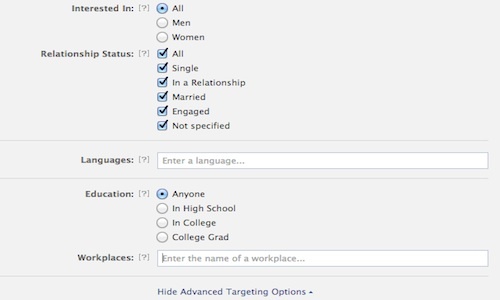 Once you’ve wrapped up Connections, you can click to view more advanced targeting options. Don’t let the language fool you; these options are really just an extension of the demographics we covered above. Here you can target your ad based on relationship status and interest, languages (which is great for brands with international presence), education, and workplace. Up until this point, all of the targeting options can be customized on both Facebook’s Create an Ad page and power editor. Setting itself apart is the recently introduced Custom Audiences feature. 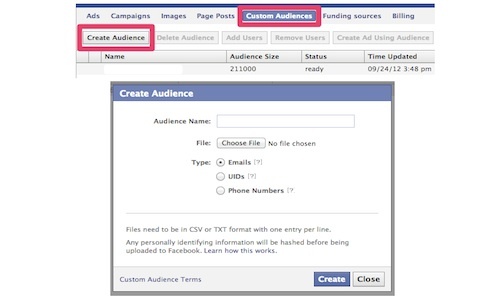 Custom Audiences lets you find your offline audience on Facebook using email addresses, phone numbers, or Facebook user IDs you’ve already collected. This allows you to create a custom campaign targeting customers who haven’t Liked your Page yet. To use this, you will have to input your email or phone list directly into the power editor. The system will match your information (which has been hashed) against Facebook’s active users, building you a custom audience based off of that list. As you’re building your ad, you’ll be able to view the audience you’re creating to the right of the screen. This gives you an idea if the intended audience is too big or too small. Also, keep in mind that targeting isn’t limited to just the settings. The language and tone you use in the ad’s message also plays an important role in reaching the right audience. We recommend that you test and track the effectiveness of several ads before locking yourself into just one area.